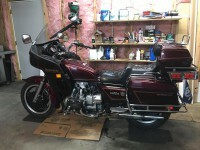 82 interstate, I already had the fork tubes out so,, drop the cowl, remove the lower fairings panels, remove the fairing, and the counterweight. unbolt the brake distribution block. unplug the wires, tach and speedo cables for the instrument cluster. remove the handlebar clamp and lay the bars back on the faux tank (with a towel to lay them on of course). disconnect the bank angle sensor in the triple tree and remove from the lower tree. remove the top locknut and the adjuster nut and remove the triple tree. lower bearing basically fell apart, twas junk. I used my Dremel to slice the what was left of the bearing. gave it a slight whack with a chisel and small hammer and it basically fell off. used a piece of 1/2" square rod to knock the lower race out from the top and the top race out from the bottom. now just waiting on the new All Balls bearings to get here. all told it took me about 1 1/2 hrs to get to this point. tomorrow is socket making day!